Anyone who's taken a ride on London's underground needn't be told about just how uncomfortable the experience can be. If it's not someone's unwashed armpit grinding on your face, it's the sheer awkwardness of being squeezed between five other agitated passengers (although at least that guarantees you'll remain standing firm in the face of turbulence). But the future is brighter, with TFL today unveiling its tube system of the future - 2020, to be exact. 250 new Tube trains will grace the Bakerloo, Central, Piccadilly and Waterloo & City lines, all of which will have a higher capacity, air conditioning, walk-through carriages, and - we're promised - more reliability thanks to new signalling systems. 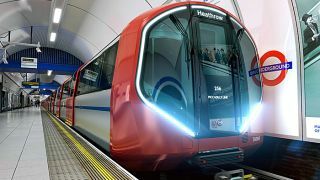 The new trains have been designed by London's Priestman Goode and look suitably next-gen. We're particularly fond of those futuristic blue lights on the front, while the interior looks like something Darth Vader would be happy to be seen riding. But perhaps most interestingly, the trains will eventually be driverless. They'll require a driver when they're first introduced in 2020 but the plan is to then make them fully autonomous. However TFL does add: "We would only consider implementing full automation following extensive engagement with our customers, stakeholders, staff and trade unions." Moving away from the new tech, the other good news is that capacity will grow by 25% on the Central and Bakerloo lines, 50% on the Waterloo line, and up to 60% on the Piccadilly. London's current 8.4 million population is expect to rise to around 10 million by 2030, which is why TFL is planning to roll out its new trains by the end of this decade to keep up with an ever-inflating city.